Travelling in Luxury Trains of India does not only mean enjoying the best comforts of life. It is also a means to explore the rich culture of India, to understand what Indian hospitality is all about and to realise how well modernity in India has blended with the age old traditions. In brief, Luxury Trains of India offer a one time opportunity for travellers to experience India and its myriad aspects.  The new luxury train, Royal Rajasthan on Wheels, gives you an opportunity explore the land of brave Rajputs in style.Comforts that match up to the best deluxe hotels in the world (with a touch of royal Indian hospitality make this week long trip an everlasting memory for you. Destination covered include Jaipur, Jaisalmer, Bikaner, Agra, Jodhpur and Udaipur. .
Golden Chariot The latest in the list of luxury trains of India, the Golden Chariot takes you on a journey to southern India. The weeklong journey begins from the capital city of Karnataka, Bangalore and passes through destinations like Mysore, Srirangapatnam, Kabini Wildlife Sanctuary, Hassan, Belur, Halebid, Shravanabelagola, Hospet, Hampi, Gadag, Aihole, Badami and Pattadakal. It is one trip you should not miss out if you enjoy exploring cultural heritage of south India in luxury. 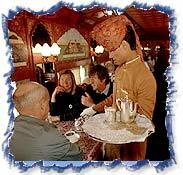 The Palace on Wheels  Amongst the top ten luxury trains of the world, the Palace on Wheels is highly popular with tourists. Its popularity can be gauged from the fact that it is always booked well in advance. Infact, because of such great demand, the authorities are in process to launch another Palace on Wheels. This will give more number of tourists to enjoy the luxurious comfort of the train. As for the destination covered by this luxury train of India, they are  Delhi, Agra, Jaipur, Jaisalmer, Jodhpur, Ranthambore National Park, Udaipur and Bharatpur. The journey commences and ends in Delhi. Shimla Kalka  Shimla Kalka is different from what you read about above. It is a toy train route that traverses through some of the most scenic routes between Shimla and Kalka. Travellers can cover this short journey by undertaking a trip in any of the four  The Deluxe Rail Motor Car, The Shivalim Deluxe Express, The Shivalik Palace Tourist Coach and The Shivalik Queen Tourist Coach. 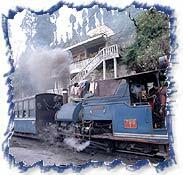 Darjeeling Toy Train  It is a beautiful journey that runs between New Jalpaiguri and Darjeeling. Darjeeling Himalayan Railway of the Darjeeling toy train as it is fondly known as covers a distance of 88 kms on a two feet narrow guage. The route passes through undulating and steep gradients and offers its passengers some of the most breath taking views. The Darjeeling Himalayan railway has also been awarded the status of World Heritage Site. The Maharajas Express  The Maharaja Express tour takes you to the entire cabinet of royal India as you can enjoy the metropolitans like Mumbai, Delhi and other most prominent tourist places of India. The train has four schedules from which you can select the most preferred one according to your choice.